For this feast of summer greens, we chose our absolute favorite varieties. Mix them up for delicious, fresh adventures in salad. 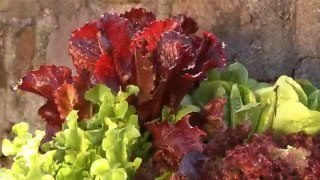 Includes piquant arugula, tangy and nutty endive and radicchio, crisp and sweet red and bright green lettuces, and sharp and spicy mustard. All are vigorous, prolific and fast-growing. Harvest fresh every few weeks for the best combination of flavors. 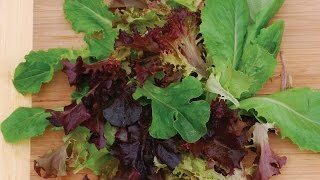 Mesclun, Salad Fresh Cutting Mix is rated 4.0 out of 5 by 1. Rated 4 out of 5 by Chestnut from Good if you like Strong Flavors! I grew this because I'm fond of "Spring Mix" in the grocery stores. I sowed multiple rows and am still getting many leaves. However, I am exclusively giving this mix to my rabbit who loves strong flavors. The varieties are way too spicy and/or bitter for me. I got: Lolla Rossa (very small leaves, though), Red Salad Bowl (small leaves also), Arugula (so quick to bolt! ), Mustard Mizuna (looks like flat endive--bugs love this one), and possibly got Black-Seeded Simpson, but it doesn't look very frilly.